The global barrier shrink films market is foretold to gain a high demand in end-consumer businesses where products are stored in retail store shelves. The fresh and processed food industry could be a good instance to follow where products such as meat, poultry, and cheese are sliced and stored in plastic trays covered with peelable and mostly with reclosable lidding laminates or films. Barrier shrink films are expected to become extremely demanding in the foreseeable future due to their excellent printing designs, capability to increase the shelf life of products, and convenience. Companies today are focusing more on providing innovative and comprehensive packaging solutions. 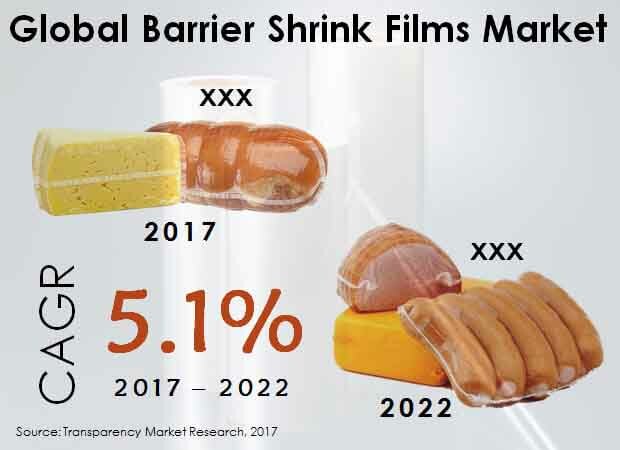 The world barrier shrink films market is projected to be cataloged into flowpacks, vacuum bags, shrink forms, chubs, and shrink wraps, according to product. Out of these segments, the market could witness the dominance of vacuum bags accounting for a titanic share during the forecast period. By the end of 2022, this segment is forecast to earn a revenue of US$1.2 bn. It could expand at a US$0.06 bn annually, which is expected to be larger than the absolute growth of other products. By end use, the world barrier shrink films market could be classified into food and beverages, healthcare, electronics, cosmetics and personal care, and other manufacturing end users. In terms of material, polyethylene (PE), polyethylene terephthalate (PET), polypropylene (PP), polyamide (PA), ethyl vinyl alcohol (EVOH), and others could be the primary segments. By barrier, the market could see a classification into low, medium, high, and ultra-high. Regionally, the international barrier shrink films market is prognosticated to honor Asia Pacific Excluding Japan (APEJ) as a leading segment securing a greater share in the near future. APEJ could rise at a 6.6% CAGR and gain more basis points (BPS) than other regions of the market during the said forecast period. North America could be a high-growth market expected to account for a US$0.9 bn of the total revenue by 2022 end. Europe is prophesied to be another region with a decent market growth but is estimated to lose 143 BPS in the coming years. Although the international barrier shrink films market incorporates the aforementioned lucrative regions, it could suffer a slow growth in other geographies such as the Middle East and Africa (MEA) and Japan. During the forecast period, the MEA is envisioned to embrace an absolute opportunity of US$0.05 bn. Japan could create a lower opportunity of US$0.02 bn during the same period. Some of the vital players operating in the worldwide barrier shrink films market could be Bemis Company, Inc., Sealed Air Corporation, Winpak Ltd., Kureha Corporation, Coveris Holdings S.A., Schur Flexibles Group, Flavorseal Llc., Buergofol GmbH, Flexopack S.A., and Premiumpack GmbH. The global barrier shrink films market is envisaged to not depend solely on one particular end-use industry, for instance, food and beverage, but it could be pampered with growth prospects also birthing in other industries such as cosmetics and personal care. Barrier shrink film manufacturers are looking to tap into the best properties of different materials such as polyolefin to offer high impact resistance, high anti-fog capacity, leak proof, water resistance, and other advantages. The report presented herewith has taken into account the opinions, estimations, and studies of industry experts and large market names to formulate projections and forecasts about the global barrier shrink films market. It offers buyers the best of market research and analysis to help them understand crucial aspects of the market. One of the widest applications of barrier shrink films is anticipated to be fresh meat packaging. Technological innovation has always been key for the development of some of the finest ranges of barrier shrink films that could be suitable for the production and secondary processing of fresh food packaging. The launch of ultra-high performance, lightweight, and new generation products for fish and fresh meat vendors could provide a strong impetus to the growth of the world barrier shrink films market. As the food industry pioneers its quest for innovative food products to satisfy demanding customers, the need for packaging that extends shelf life, enhances protection, and improves product visibility is projected to increase. The international barrier shrink films market is prophesied to be segregated as per type of product, end use, type of material, and type of barrier. In respect of product, the market could be classified into flowpacks, vacuum bags, shrink forms, chubs, and shrink wraps. Amongst these, vacuum bags are anticipated to hold a larger share in the market while expanding at a CAGR of 5.8%. On the basis of end use, the international barrier shrink films market could be divided into food and beverages, healthcare, electronics, cosmetics and personal care, and other manufacturing end users. By material, there could be segments such as polyethylene (PE), polyethylene terephthalate (PET), polypropylene (PP), polyamide (PA), ethyl vinyl alcohol (EVOH), and others. In terms of barrier, the market is projected to be segmented into low, medium, high, and ultra-high barriers. On the geographical front, the international barrier shrink films market could include Asia Pacific Excluding Japan (APEJ) as a major region boasting of a colossal share. Between 2017 and 2022, APEJ could gain 255 basis points (BPS). Japan and the Middle East and Africa (MEA) are expected to grow sluggishly in the coming years. However, North America and Europe could exhibit a positive growth in the market. Not to forget, Latin America is forecast to be another market important for barrier shrink films. The worldwide barrier shrink films market is predicted to witness the presence of leading companies such as Bemis Company, Inc., Sealed Air Corporation, Winpak Ltd., Kureha Corporation, Coveris Holdings S.A., Schur Flexibles Group, Flavorseal Llc., Buergofol GmbH, Flexopack S.A., and Premiumpack GmbH.